Chris Pratt went from being a doughy comedian to being a cut action star when he signed on to star in Guardians of the Galaxy, but he wasn't the only star of that movie to recently pack on pounds of muscle for a role. As it turns out, Bradley Cooper - who voiced Rocket Raccoon in the Marvel Studios film - got very committed to his part starring in Clint Eastwood's American Sniper and added a ton of weight in preparation. "I had to do right by him and his family, there was really no choice. You're sitting across the dining-room table talking to this person's father and mother. And his children and wife are there. And he's passed away. Knowing that they are putting all of their stories in your hands and the responsibly of that, it's actually unique." You can really see just how big he got in this still from the trailer. Look at his neck! 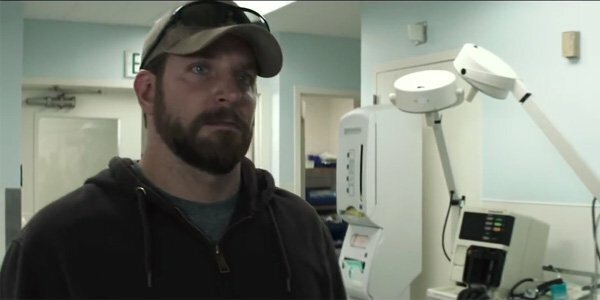 In addition to changing physically for American Sniper, Cooper also worked with Navy SEALs to ensure he had all of the right moves (which I'm sure didn't hurt the getting in shape part either). The actor wound up working right alongside soldiers who had worked right alongside Chris Kyle. Among them was Kevin "Dauber" Lacz, Kyle's sniper partner during his last two tours of duty who also served as a technical advisor on the film. "Even though it was actors through the scope, they were human beings. It was a whole other deal. I remember getting a chill through my body realizing what he had to do." Cooper has been working hard to make this movie for years - having signed on to produce and star back in 2012 - and while there was a time when Steven Spielberg was attached to direct, the torch was eventually passed to Clint Eastwood. American Sniper will be getting a limited release on Christmas Day this year - qualifying it for the Oscars - and will get an expanded release on January 16, 2015.